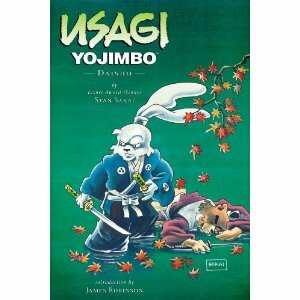 This is an excellent read that balances all the aspects of what makes Usagi a success. There are several independent stories, no doubt based on classic tales from Japan, that seem to blend into each other as our hero journeys through life. There are characters from previous adventures and consequences from earlier tales. There is much history and culture to be learnt as the traditions and crafts of old are brought effortlessly to life. All of these elements are fused together fluently. The reading experience feels so light yet compelling. It is surprising how much you take away and how quickly you sail through the pages. The art is great and back to the fine line work of old. There were one or two panels that were meant to be read across both pages and that wasn’t clear until after you read them the wrong way but this was an isolated blip. Thumbs Up!